Teulada-Moraira is a delightful resort with Moraira marina proving to be a magnet for holidaymakers and locals alike. Sporting celebrities have holiday homes in the region and can often be spotted enjoying a drink with friends in one of the bars by the marina. Moraira is midway between Javea and Calpe in north Costa Blanca. It is handy for Alicante airport and close to the AP7 motorway and N332 main road. Holidaymakers love its little beaches, beachside restaurants and the two distinct old towns of Teulada and Moraira. It is a perfect blend of old and new, Spanish and cosmopolitan. You can get a real Spanish feel from many of the bars and restaurants serving fine regional cuisine. Look out for those serving fish with the Bahia de Moraira seal of quality, which means the fish served is from the port and Moraira fish market. Rice wrestles with the local fish and shellfish to take pride of place on your plate. The region serves up many varieties of rice dishes including paellas, arroz a banda (rice with fish) or oven-baked rice specialities. Try one of the local wines with your meal and you will not be disappointed. Teulada and Moraira produce a number of good red, rose and white wines as well as the sweet Mistela wines. If you are missing the comforts of home, there are also English bars, restaurants and supermarkets in the towns. The town planners have kept a close eye on neighbouring developments and you will not find a high-rise building within its limits. Many expats and holidaymakers rent villas with their own swimming pools. Moraira is a firm favourite with families, sports lovers and older holidaymakers who enjoy the clean beaches, culture, cuisine and a laidback lifestyle. There are six beaches which have their own distinct style and holidaymakers will soon find their favourite. The small, shell-shaped El Portet beach is favoured by those looking for a quiet place to sunbathe and swim. L'Andrago Cove is a favourite with divers and fishermen who like to explore the rocks and marvel at the clear waters. Whatever takes your fancy, you will want to see more of Moraira. One way to get your bearings in Teulada is to take a stroll through the old town. The modern town hall stands in the Plaza de la Constitution, which is a good place to start. Head for the Plaza de la Creu to see where the medieval gateway to the town stood. Further along is the church square, home to the Iglesia de Santa Catalina. Start at the main street, known as Dr Calatayud, and visit the parish church built in the 19th century. Its main doorway with its arches and porticos is a typical example of the region's architecture known as riu-rau. Walk down Almacenes and you will come to Playas y Mar street, which is the oldest and most picturesque street in Moraira. After stopping to take photographs, you will come to the old retaining wall called the Margenot, which protected the place from stormy seas. 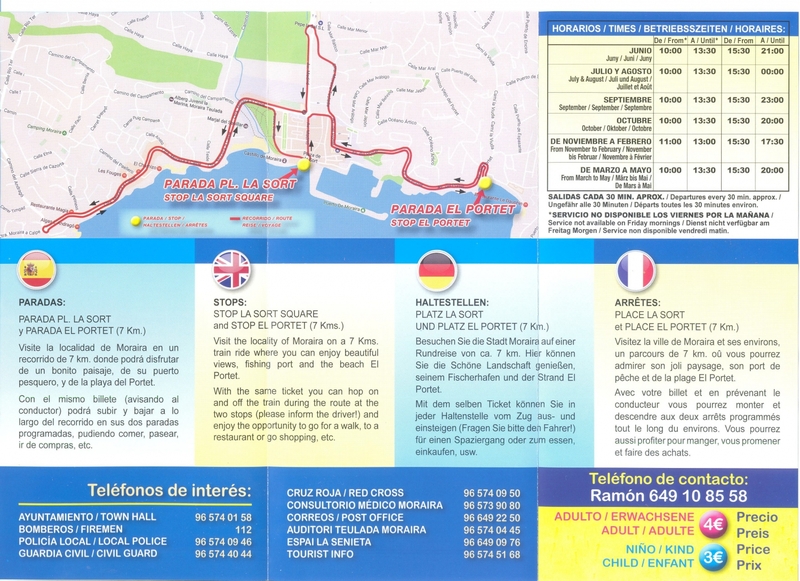 If you don't fancy walking, you can take the tourist train which runs along the main streets, past the port and towards El Portet beach. This is a fairly small building considering its status as the parish church. Teulada residents had to raise a special tax to pay for the Renaissance-style church. Found in the square of the same name, the blue dome contrasts with the brilliant white stone building. A panel painting of St Vicente Ferrer is found over the altar. This is a very interesting shrine and definitely worth a visit as it is believed to be the site of a miracle. The shrine has a font where it is believed St Vicente Ferrer produced drinking water for the first time to quench his sister Constanza's thirst. Water has never stopped flowing since then. Nuestra Senora de los Desamparados is a charming church in Moraira town centre. It was built from stone taken from the castle. The beautiful stained-glass windows are an interesting feature. The statue of the patron saint of sailors, Virgen del Carmen, is kept here. The court building is an outstanding example of 17th century architecture with its large arches and sundial. The town council continued to hold meetings in this building until 1991 when the modern town hall was built. The former home of Constanza Ferrer, Vicente's sister and the subject of the miraculous drinking water, is next door. This watchtower stands at the highest point of the cape over El Portet beach. It was used to warn residents about possible invasions. This was built in 1742 and has a curious shape, known as an Ox's Hoof. Concerts are put on here during the summer. The crystal-clear Mediterranean waters provide the most popular sporting playground in Moraira and Teulada. It is particularly popular with divers as it has five spectacular routes to explore the coastline and coves. Sailing, canoeing and jetskiing are also well catered for by the yacht club and other schools. Moraira also has tennis courts, gyms, football pitch and skateboarding arena. Teulada holds a market every Wednesday where you can buy fruit, vegetables, herbs and spices. Moraira's market is on Friday and is one of the biggest markets on the Costa Blanca. As well as fruit and veg, you can get your hands on ceramics, leather goods and shoes. To sample some of the local wines, take a trip out to the Sant Vicent Ferrer co-operative, which produces red and white wine, a sparkling white wine made from the Moscatel grapes, and the sweet Moscatel wine. These can be bought at a very reasonable price and make a lovely souvenir of your stay. The turquoise waters, coves and bays have made Moraira a popular choice for divers and snorkellers who can swim among shoals of fish, flora and fauna. The castle is unusual as it is at sea level and by the sea. It is an ox hoof shape with one side being round and the other is straight. Look out for restaurants serving fish stamped with the Bahia de Moraira stamp, which is a sign of quality. Moraira has a very large open-air market held each Friday in the main car park where you can buy clothes, household goods, fresh fruit and veg along with other goodies.